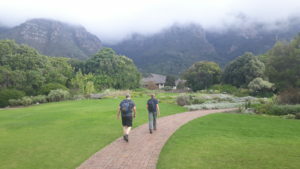 Here is Klaus and Ferdinand enjoying the 5 day Table Mountain trail. I was happy to accept and dwelved right into it. We started our hike at the Cape Point Light House dating back to 1860. 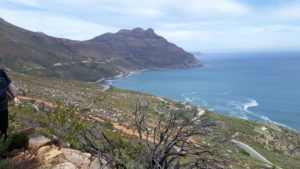 The trail met us with many blossoming Fynbos and amazing weather conditions. The focus was to explore and connect. Klaus and I could catch up and Ferdinand shared his experiences back home and how delighted he was to return to this beautiful place. We also encountered many other fauna. The suprise of the day was the Ostriches and a brisk walk along the beach. 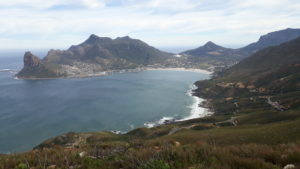 It was school holidays which meant many families came out to picknic and enjoy a lovely swim along the Falsebay coastline. We also managed to best our time by 1hour and 45minutes this being one of the many highlights of the day. 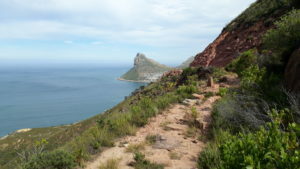 The hiking trail above the world famous Chapman’s Peak drive was a feast. The ever changing vegitation was spectacular. 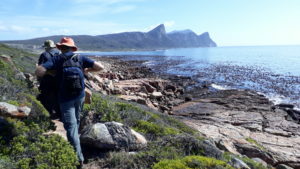 In 2015 we saw the Cape Peninsula Fynbos fires ravage this area and since then there are the regular pioneering Fynbos species flowering including the growth process of the old and new species I have not encountered before. 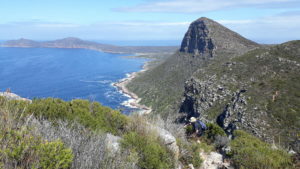 With the cable car closed we still managed to hike up Table Mountain via Skeleton Gorge and Smuts track. 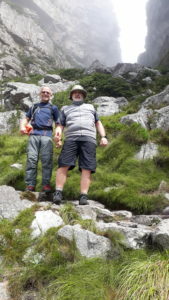 Hiking through Skeleton Gorge is a great pleasure and for my good friends Klaus and Ferdinand it was a first. 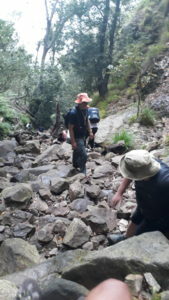 The few ladders made it fun and we were serenated with the trickling of the stream flowing gently down the gorge. 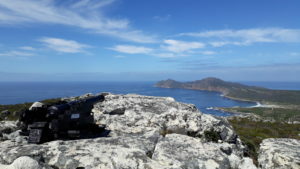 We made a quick photo stop at Maclears beacon the highest point on Table Mountain before heading towards Platteklip Gorge which will be our path down. We finished strong and congratulated eachother for another successful hike across the Cape Peninsula completed. The company was joyous, the views nothing short of breath taking and the connection was cosmic.